Sometimes, our life really is a zoo. Whose isn’t, amirite? 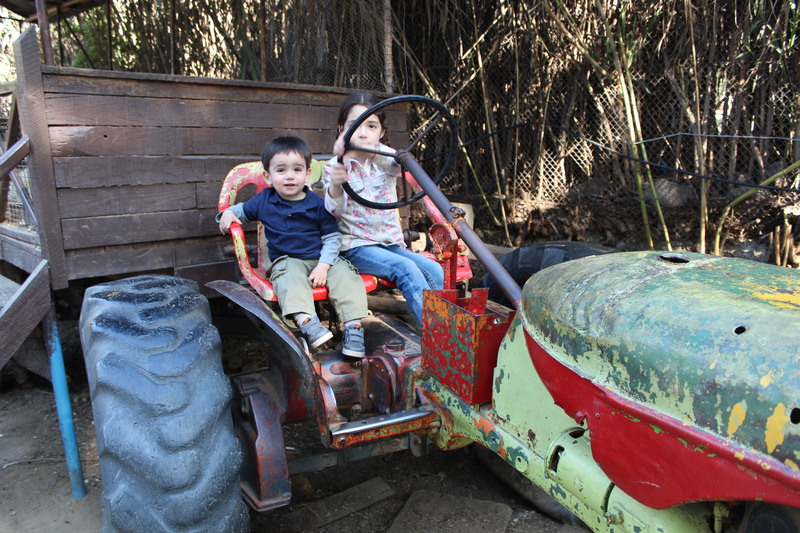 But this post is actually about our trip to the zoo…the Buin Zoo to be exact. 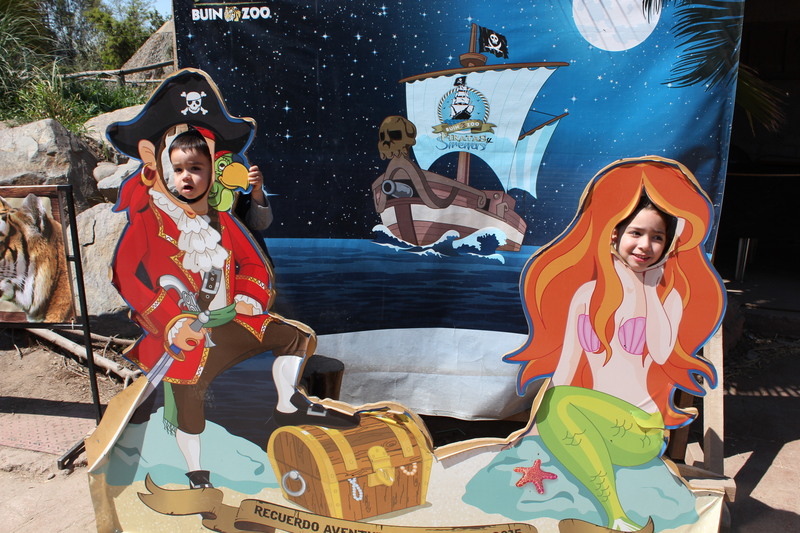 Our whole family had never been to this zoo, which is the largest in Chile (even the 30-something Chilean who had spent the majority of his childhood living less than 20 miles from it). 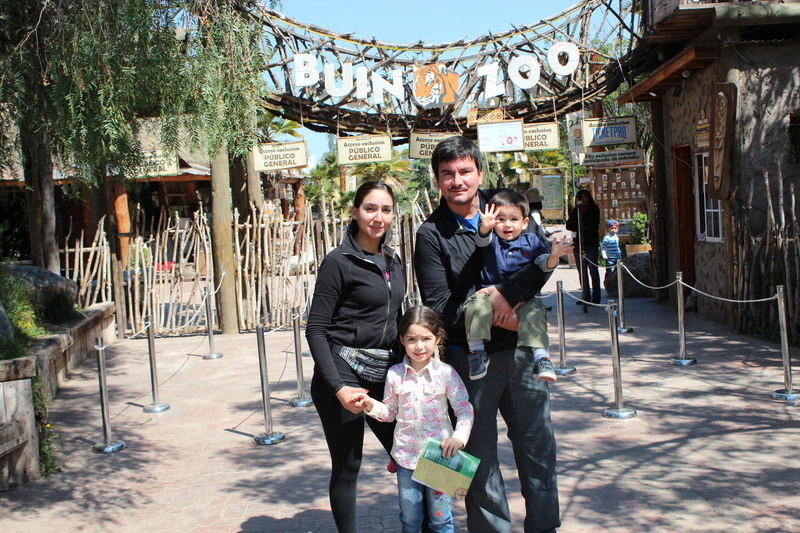 Joaquin’s first and only zoo trip was when he was a wee little thing visiting the USA for the first time. I love the Brookfield Zoo, I have a lot of fun family memories from there, especially with my animal-loving cousins. That won’t be Joaquin’s last trip to Brookfield. However, now that we’re State-bound for sure, I want to pack in as many fun Chilean activities as possible for Joaquin (yeah, maybe for me too), before we head out next year. We invited my sister-in-law and her daughter. 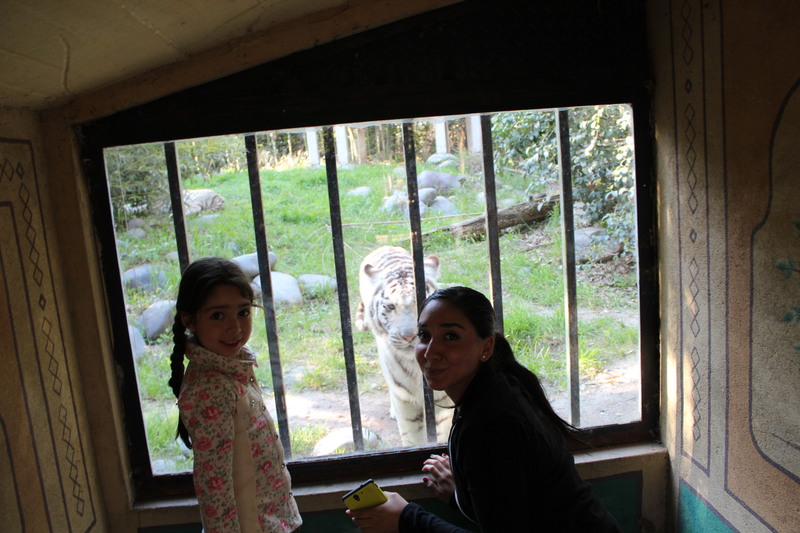 My sister-in-law is now part of the Chilean police force, so she gets in for free at the zoo! Major perk alert! The entrance fee is 7,500 pesos for adults (roughly 14 dollars) 5,000 pesos for kids over 90cm and up to 14 years old, 4,000 pesos for adults over 60 and free for kids under 90cm (nice work Joaquin…another point for my case that he should stay the same age and size forever and ever). There are additional charges for the marine show (1,400 pesos p/p). It’s a 40 minute drive south from where we live in Ñuñoa, which is a pretty central comuna in Santiago. The five of us were able to see almost all of the exhibits, and we all agreed that the marine show was our favorite part. No dolphins, but there were some pretty adorable sea lions. Joaquin had no vote as he slept through the whole thing. Joaquin was most excited about the fish tank at the beginning of the aquarium exhibit because it was the only thing at his eye level. 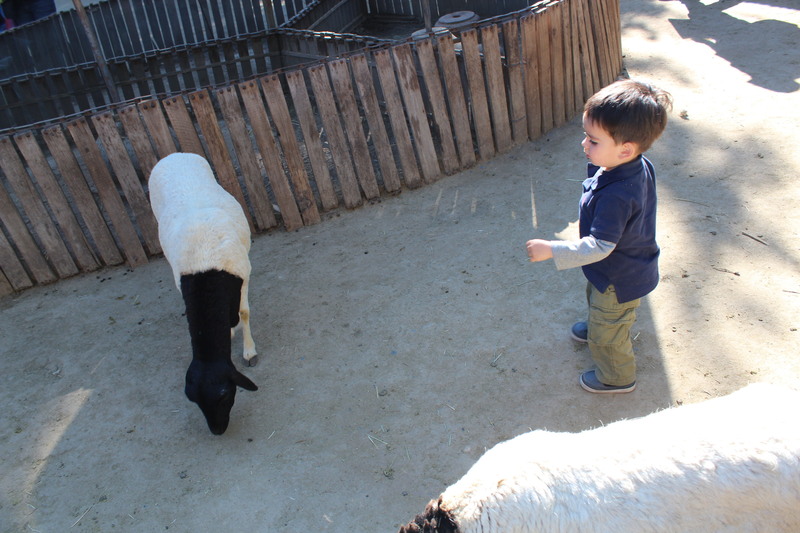 He was also a big fan of “Baby Zoo”, or their petting zoo. We were eating ice cream and we couldn’t go in before we finished. I think this was more for our benefit than for the animals benefit, as the goats and sheep got nice and intimate with our stroller immediately as we entered, presumably looking for loose snacks (or toddlers). He looks like a little man in this picture, and it’s scaring me. Stop growing!! A white tiger took a particular liking to us. All she was thinking was that we were lucky to have that thick glass separating us…you can see it in her eyes. We liked this zoo, but here are my notes. There is not a lot of shade, especially in the Africa section. It also states on their website that you can’t bring in food, but we saw plenty of families eating their packed lunches, and there are many picnic sections. I’m not sure why they’d say that…maybe for first time suckers like us who are rule-followers and ended up spending 60 dollars on a not-so-great lunch at their only restaurant. Bring your own lunch! Also, they rent out wagons for your kids, if you don’t want to bring a stroller in. And finally, bring lots of water, especially in the summer when it’s HOT. They were charging 1,300 pesos for a standard sized water bottle and there were no water fountains and I had run out of my own water. Lame-o. I have been cooking up a storm this spring in Chile. I’ve been more adventurous with my recipes, and a trip to the Chinese supermarket in Recoleta/Patronato last month has brought a new flavor to our table: rooster sauce. I know, I know that it’s not sauce made from roosters, that it’s that spicy sauce with a rooster on the label that you always see in Chinese food restaurants (and which I’ve never tried in my life before October 2015). 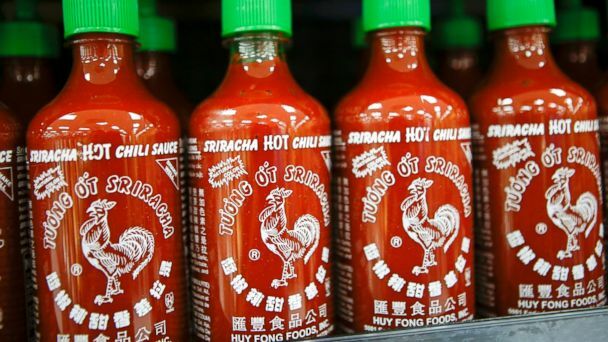 I was browsing the aisles looking for something completely different, and recognized Mr. Rooster and remember that a lot of Beth’s recipes on Budget Bytes use Sriracha. I don’t even remember how much it cost, I was just excited to find an important ingredient that I had seen in a lot of appetizing recipes of hers. This was my first experiment with Sriracha, and it turned out DE-LI-CIOUS. I made it once with boneless chicken thighs, and another time with boneless chicken breasts. Both great. Chicken thighs are juicier than chicken breasts, but I prefer chicken breasts for less random fatty pieces. You could also do it bone-in and would turn out great as well. 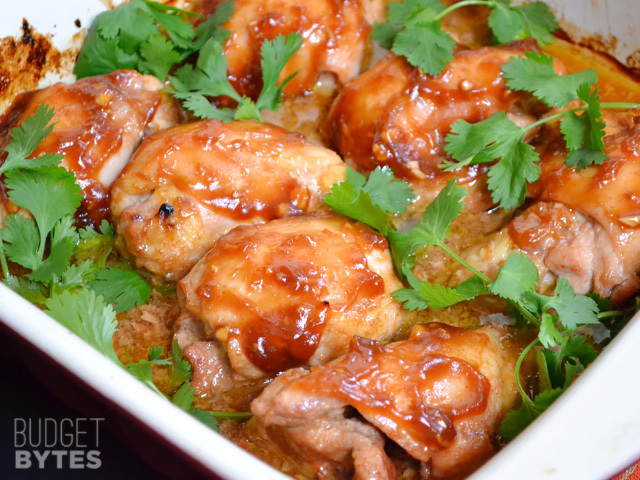 The sauce makes the dish…otherwise it’d be some boring baked chicken. It’s spicy, but not so spicy that you can’t enjoy it. If you’re crazy for the spicy, add a little more sriracha. However, it also has honey and sugar (sweet) and soy sauce (salty), so you’ve just got a total flavor explosion when you sit down for dinner. I followed the recipe exactly and I recommend it 100%. 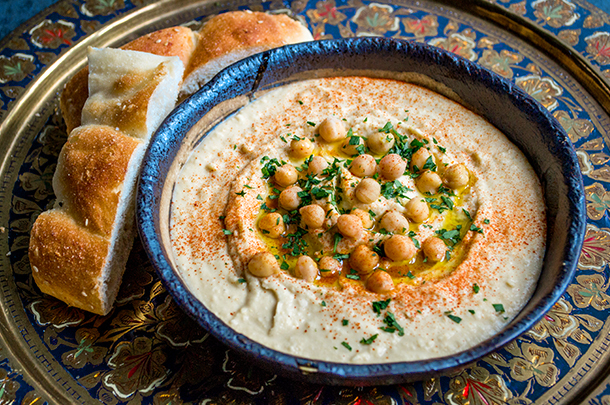 I had originally been to the Chinese supermarket to look for tahini, in order to make my own hummus. It all started when I shelled out nearly $7 dollars on premade imported hummus at the grocery store and it ended up being expired. Jumbo, the grocery store, had placed a sticker saying that it expired in October, but when I tasted it, it tasted all sorts of expired. It tasted like they had put Pop Rocks in it, I kid you not. I had a better look on the clear plastic top and very lightly printed (but readable), the original expiration date printed was a week before I had just placed that hummus in my mouth. Yuck. I felt scammed. But do you know what the worst thing was? I tasted it, and it was weird and fizzy like Pop Rocks, and I thought, maybe it’s just the red peppers. So I kept eating it because I REALLY wanted hummus immediately. I kept trying to force myself to eat it, and after the fifth bite, I googled ‘expired hummus taste’ and there it was…fizzy. (Mind you, this was before I found the original expiration date). I was so disappointed for two reasons: that I had to stop eating it because it was definitely expired, and also that in my denial, I had made myself eat expired hummus for five entire bites. Since I was NOT going to be out 7 bucks, I marched myself back to the grocery store and demanded a refund. Because Chilean stores a more scammy than American stores, they never give you your money back, they give you a stupid store credit. I would have used my 7 bucks to buy tahini at Jumbo to make my own hummus, but it cost 14 bucks…no way José. I bought bread and avocado instead. At this moment, I had such a craving for that damn hummus that I told Andrés that we should just make a trip out to Recoleta the next day and go to the foreign supermarkets to get tahini (and maybe some chicken potstickers…otherwise I doubt he would have been so enthusiastic to go with). You can’t really make hummus without tahini, and that was my only missing ingredient. Again, didn’t even look twice at the price (maybe 4 bucks for a jar??) because I was so excited to make HUMMUS, and I had just gotten my paycheck too. I didn’t decorate mine all fancy like the picture, but rather just starting shoving pretzels into the blender and then directly into my mouth. On that note, I had to use my Oster blender because I am not fancy enough to have a food processor. It took a bit of stopping and starting and mixing with a spoon because that stuff is thick, but it’s doable. 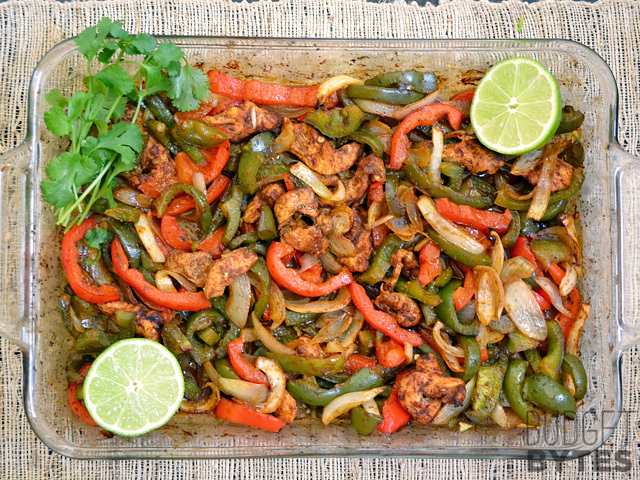 Next time I make it, I’ll add some ingredients to add extra flavor, maybe more paprika or roasted red peppers. This recipe makes a lot, so it’s good for someone like me who will eat all it in two days; or more realistically to bring to a party or a family gathering. PS – don’t ever judge someone for eating an entire bowl of hummus by themselves – you just may not appreciate the entire goodness of it. Her homemade seasoning is EXCELLENT. Much better than any pre-packaged seasoning in my opinion. It’s also really great to know exactly what you’re putting into your mouth, because you prepared everything yourself (besides the optional sour cream). This pan made dinner for two hungry humans for two nights in a row. We live in Chile, so we HAD to include avocado along with the sour cream, but you can include anything extra to make it your own – salsa, lettuce, tomatoes… As I was eating it I was thinking, when is an acceptable timeframe to make this again? Friday night, it’s already been decided. I am not a cook, but these recipes make me seem pretty talented…I could tell by the look on Andrés’ face while he was eating. That’s how well I know him. Enter your email address to follow this blog and receive cool points in return.
" ... And ye shall know the truth, and the truth shall make you free.."
1 positive. 365 days. 365 positives.